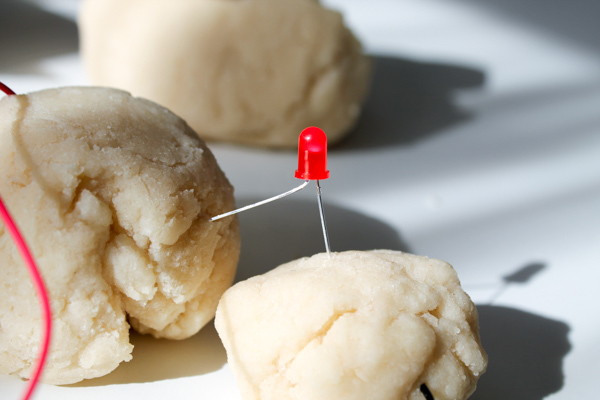 Making electric play dough is a really fun and easy science experiment to try out at home with your kids. 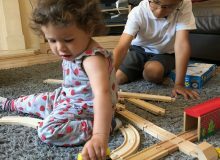 They can learn about circuits and electric currents, tinker with the materials and experiment whilst getting creative with their playdough. 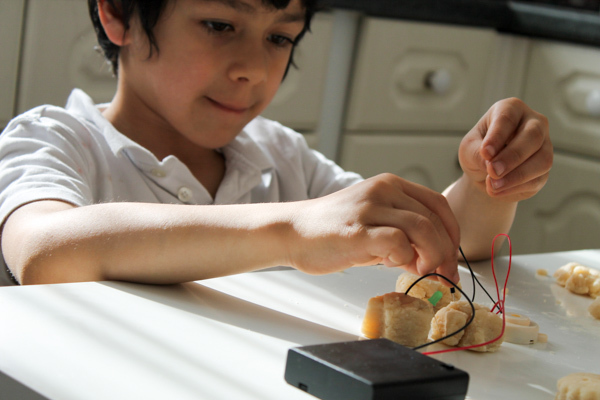 We made our dough with the help of a handy DIY electro dough kit from Tech Will Save Us, inspired by Squishy Circuits, created by the students at St Thomas University. 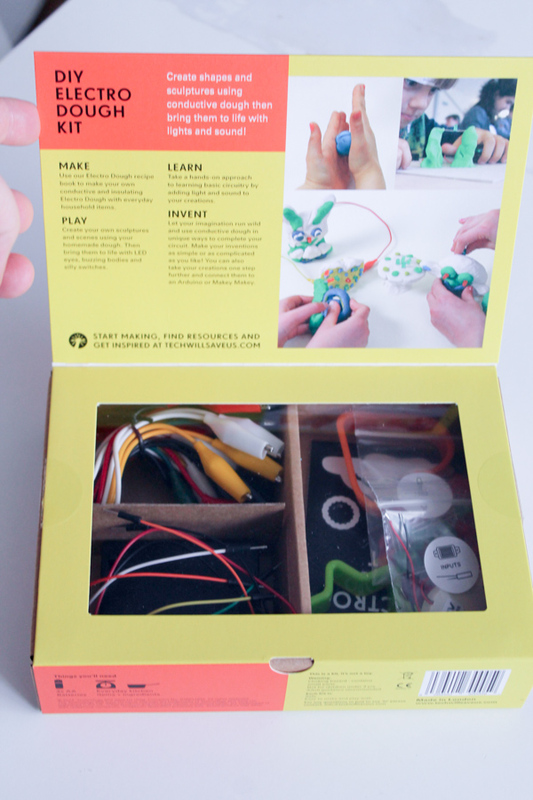 The kit contains simple playdough recipes for electric play dough and non conductive play dough, to allow you to experiment with both kinds. 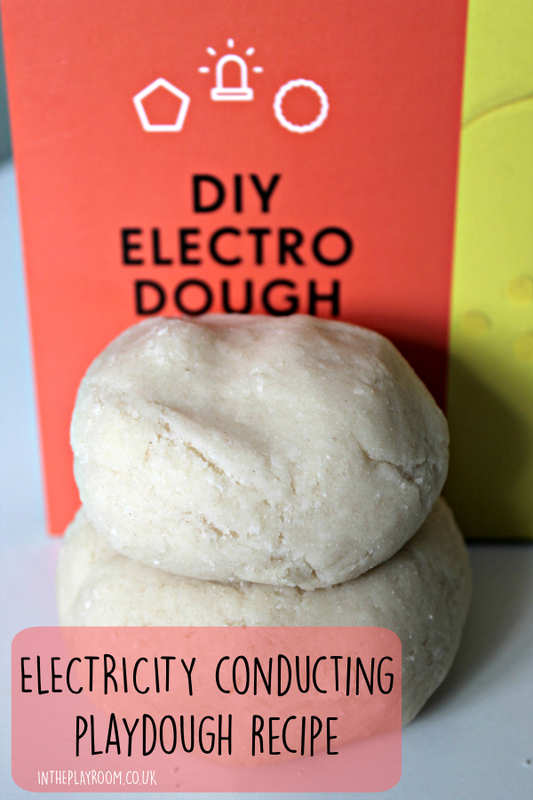 Here’s the recipe for the electric play dough – It is super easy! Add the water and salt to the pan and bring to the boil until most of the salt has been dissolved. 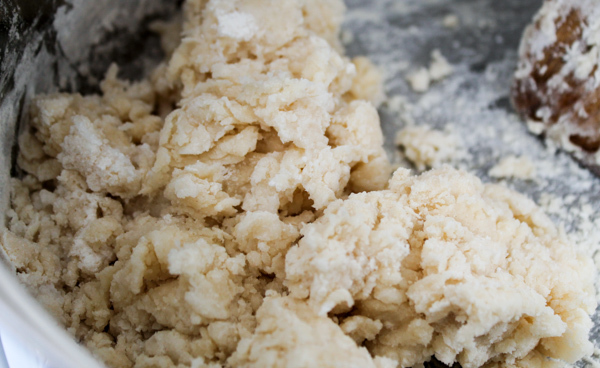 Remove mixture from the heat and knead it in a little flour until your desired consistency forms. 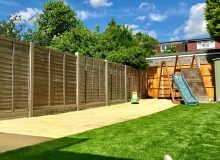 You can also add colour if you wish, we kept our plain for now but will experiment with colours next time. 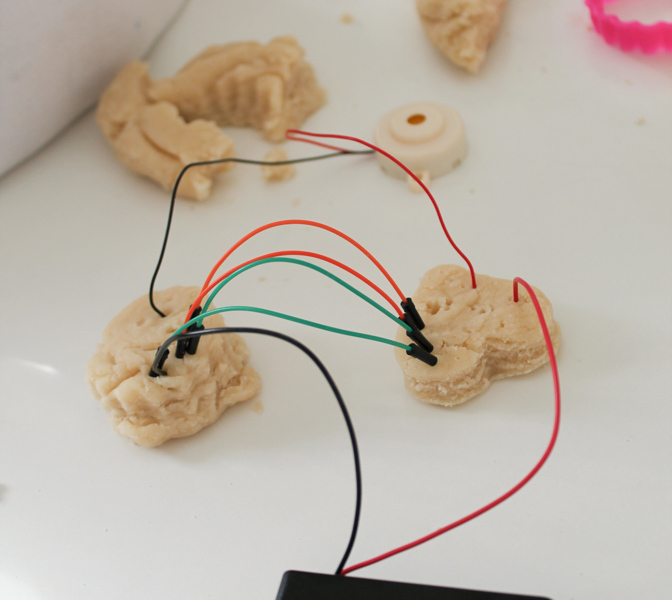 To play with your electric dough you will also need a battery pack, wires, and LED lights or a buzzer – which are all supplied within the Tech Will Save Us kit, along with some playdough shape cutters and extra crocodile clips. 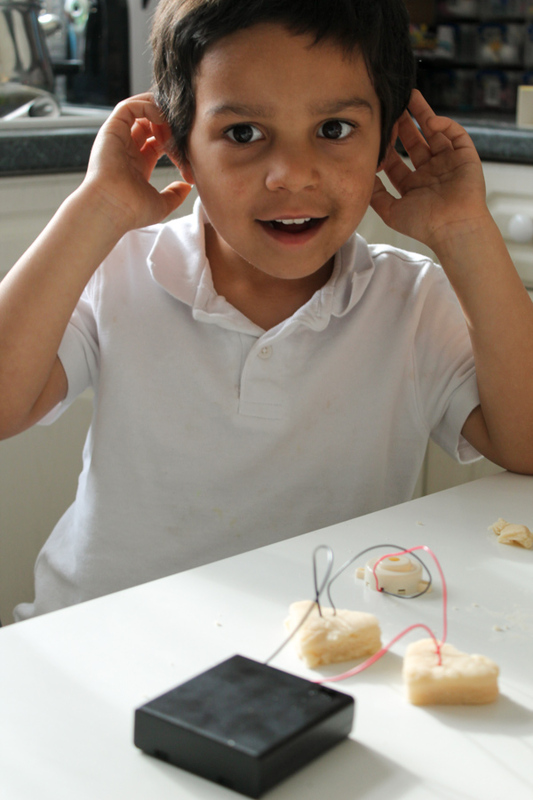 As well as following the circuit plans, you can make up your own circuits and experiment. I loved seeing the boys moving the wires around, and experimenting. 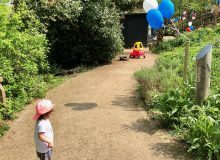 “Hmm I wonder what happens if I do this” is a great way to learn by their own experiences and mistakes. The buzzer was a huge hit with my boys. 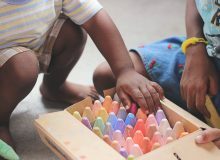 They loved making their play dough make a noise! T soon experimented and found out that he could adjust the volume of the buzzer by adding additional wires between the two pieces of playdough in the circuit. The more wires he added, the more the volume reduced as some of the current would take the short route travelling down those wires and skipping the buzzer entirely. He also enjoyed experimenting with adding extra lights and seeing how the current was shared between them making each one dimmer. 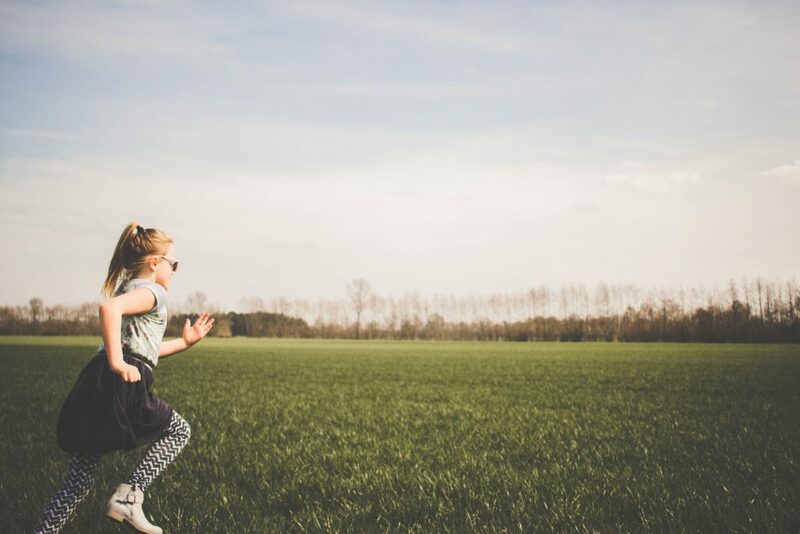 Technology Will Save Us have lots of other fun science activities for kids too. We will be sharing the DIY thirsty plant kit activity soon. 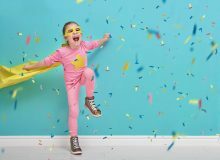 Follow Anna – In The Playroom’s board STEM : Science Technology Math and Engineering for Kids on Pinterest. Can you substitute the vegetable oil with a different oil? yes, any type of oil should work. What an awesome idea! 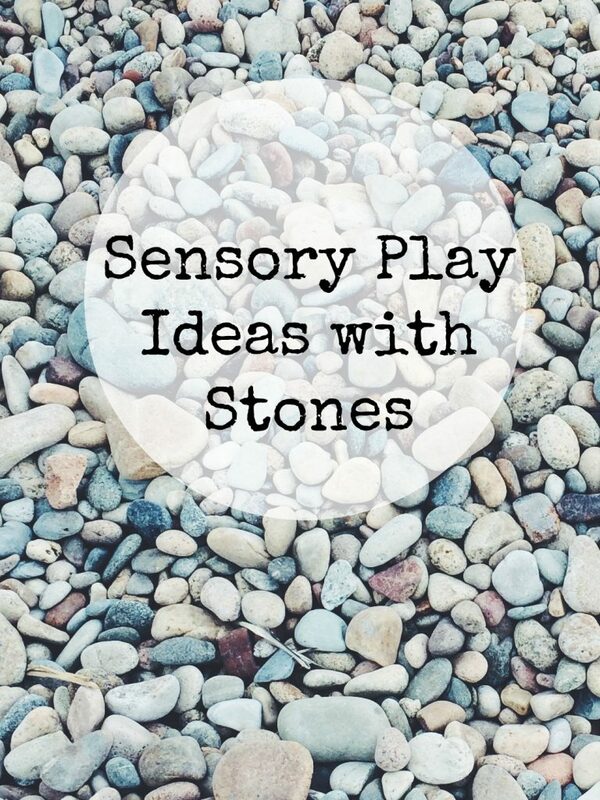 The kids already love playing with play dough, but this would be such a great way to extend the activity and a perfect science experiment for school age kids!